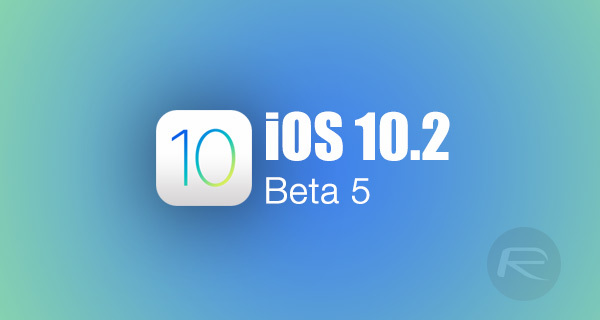 Only few days after releasing beta 4 seed, iOS 10.2 beta 5 is available to download right now for compatible iPhone, iPad and iPod touch devices from Apple Developer Program portal. This latest beta comes approximately a month after Apple introduced iOS 10.2 for the first time, and looks to further progress the said firmware in order to get it into a position where Apple feels it can be consumed by the masses on a truly global scale. Rather than actually introduce any new changes that haven’t already been noted in previous iOS 10.2 beta builds, beta 5 simply continues the path that Apple had already started walking down when the initial developer seed was pushed out more than four weeks ago, with this beta bringing further bug fixes and improvements throughout the system. With that said, iOS 10.2 itself is a notable upgrade. One main addition to iOS 10.2 is the inclusion of new and improved emoji characters, such as the stunningly detailed avocado, as well as new faces such as the rolling face, the selfie emoji, a hilarious face palm emoji, and a clown face that will either terrify you or delight you depending on your view of clowns. Apple has also integrated Unicode 9 to bring new male and female characters, such as a set of new professionals in the form of a doctor, lawyer, scientist, and firefighter. Apple has also used iOS 10.2 as a means of introducing changes through the system. As an example of this, the native Music app has had slight UI changes introduced to commonly used controls. There’s also the inclusion of the new TV app which was initially introduced as part of Apple’s “hello again” Mac event only recently. All in all, iOS 10.2 represents an impressive improvement to the platform, with it only being a matter of time until the full and final seed is released to the public with compatible devices. As always, registered developers can access the dedicated Apple Developer Portal to get their hands on the latest iOS 10.2 beta 5. If the iPhone, iPad or iPod touch in question already has an Apple issued configuration profile installed then it’s also possible to get iOS 10.2 beta 5 as a direct over-the-air update from the Software Update mechanism (Settings > General > Software Update) within the native Settings app. UPDATE x1: Here’s what is exactly new in this beta 5 update of iOS 10.2: iOS 10.2 Beta 5 Features, Changes And Known Issues. Available as public beta as well.